I have to preface this recipe by emphasising that although this is definitely healthier than a regular fridge cake recipe, I don’t necessarily consider it to be healthy, as in something you should eat daily. But, it’s a great dessert to wow friends and enjoy now and then. 200g dark chocolate 70% (I used 2 bars of Green and Black 70% dark chocolate), chopped small. If you love dark chocolate you could use 85%. 1 cup mixed nuts. My mix had cashews, pistachios, pecans, macadamias and almonds. Bring a small saucepan of water to a gentle boil. Place a small glass bowl on top of the pan of boiling water to create a double boiler. Add the chocolate, butter and salt to this glass bowl. Stir regularly until the chocolate and butter is melted. In a separate medium size bowl, add the goji berries, raisins, dried figs and nuts. Once the chocolate and butter are completely melted, remove from heat and pour into the bowl of dried fruit and nuts. Stir well to combine. I like my chocolate really chunky with lots of piece of nuts and fruit in it. Line a piece of Tupperware or a small pan with cling film, and be sure leave the cling film long enough that it hangs over the edges of the pan. The Tupperware I used was about 9x7. Pour the chocolate mixture into the Tupperware and spread evenly. 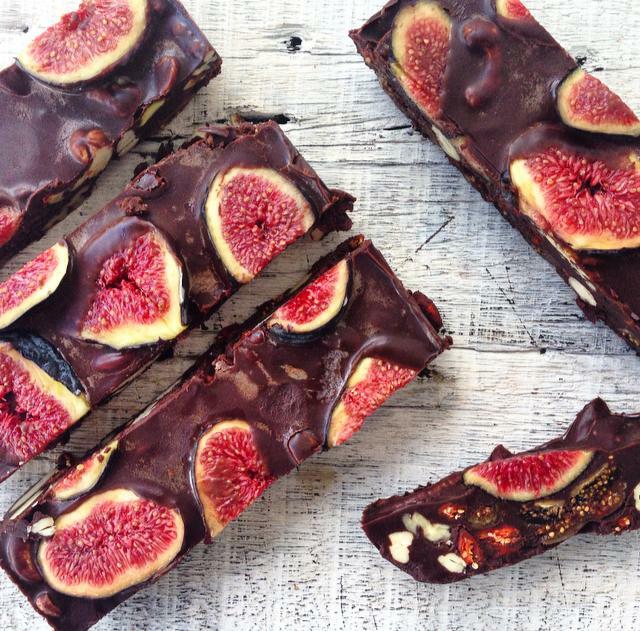 Top with pieces of sliced fresh fig, pressing the fig slightly down into the chocolate. Place Tupperware in the refrigerator for 1-2 hours until completely firm. Once firm, hold the edges of the cling film to pop the fancy fridge cake out of the Tupperware. With a large, sharp knife, cut into small cubes. Store in the fridge or freezer. Enjoy...and don't forget to share!!! You could also make this with raw chocolate bars.